My Purpose for this Notebook: The notebook provides a means of incorporating time management and self-motivation into the high school student's day. I used this sort of notebook in conjunction with a student planner that contained lesson plans for other subjects. The student also followed a posted schedule that dictated the order of classes and a suggested time and time limit for each class. This particular notebook was for my daughter's 11th grade English class. We met and discussed her weekly assignments twice a week. In the first meeting, we discussed her assignments for the week. The second meeting took place a day after her assignments' due date. That gave me one day to evaluate her work. In the second meeting, we discussed her completed work. 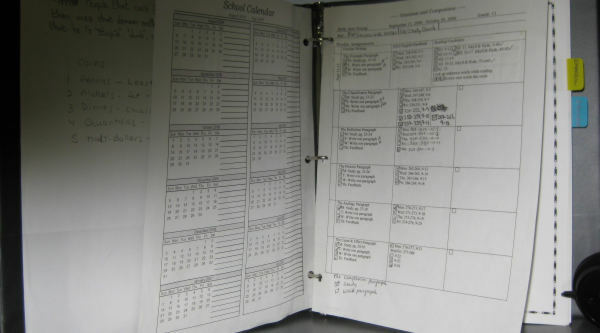 The binder is one-inch, 3-ring, heavy duty. The first page is a cover sheet. The cover sheet is shown in the image above, the color image. I made it in a word processor. The cover sheet could be on the cover of the binder instead of inside the binder. Behind the cover sheet I placed a calendar and 6-week schedules. 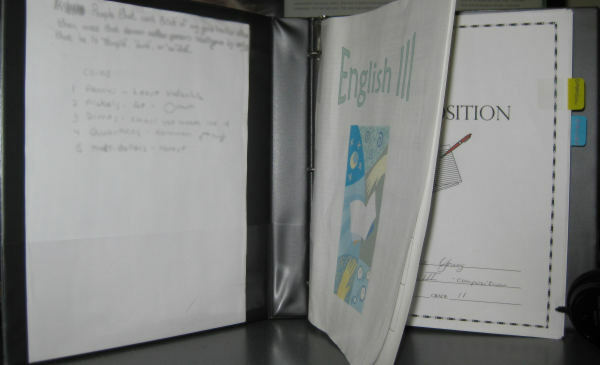 To plan my children's upper grade English classes, I used my Grammar and Composition Planner. The planner has three columns to plan the parts of high school English: composition, grammar, literature, vocabulary, and presentations. I used the planner by placing composition and presentation assignments in the first column, grammar assignments in the middle column, and everything else in the right column. My daughter did her work inside the notebook, and so I placed appropriate notebook paper inside the binder. I used my Composition Filler Paper. I designed this paper specifically for the student to use for writing paragraphs and essays. I use the right column for evaluation marks and comments. A *paper explaining the class, what it is and it's benefits. *Papers that detail parts of the subject, in the case of this class, essentials of good paragraphs and essays. My requirements for the class, such as neatness, typography, timeliness in turning in assignments, etc. Dividers for composition and literature. I made the dividers from Notebooking Cover Sheets printed on card stock. *Note: Check the books you are using for the class for this information. A list of resources such as books, web sites, etc. In Holly's Art III class notebook, I included both a glossary of definitions and printed art examples that were referenced to the individual parts of the class. Some classes only require a syllabus or less and those classes may not need their own notebook. You must supply information to your student and your student must read it. The supplied information varies by subject and some examples of are listed below. How the finished work will be evaluated, if late assignments lose points, and any other grade affecting actions. Guidelines for the assignments: For example - If the subject is a lab science then supply lab report requirements. If the subject is English then supply requirements for written assignments, and optionally, any "helps" such as paragraph and essay formats. Note: I have a syllabus form in the Garamond Collection. It is called Class Planner and is available in rtf and doc. 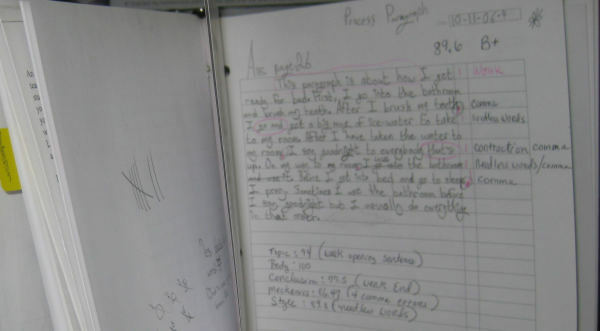 Before handing the notebook to the student, go over the class notebook. What parts to read now.